I hope it has been a good start to the year for you as it has been for my jewelry crafting pursuit, so far. Orders had started streaming in during the first day when I officially started taking in custom orders for the year. My work book is starting to fill up and I can't help but feel a sense of wonderment and gratefulness toward how my love for creating jewelry has led me this far. I like being "creatively" busy! The past 2 weeks, I've been quite up to my neck taking in orders for the Chinese New Year - mostly to make a matchy accessory for their cheong-sams. I've always admired women who can pull off pretty cheong-sams. Especially those that are modernized with contemporary colors and designs. So I'm really pleased to have made some creations catered to match with their dresses. If you are keen to see what I've created, you can view my completed creations on my facebook page which I update almost on a daily basis. Now here's something that you may like to have and wear with your CNY outfit! I have a giveaway of 2 pairs of "firecracker" earrings creation to 2 of my readers! I'm doing this giveaway differently from my previous ones done on my blog. 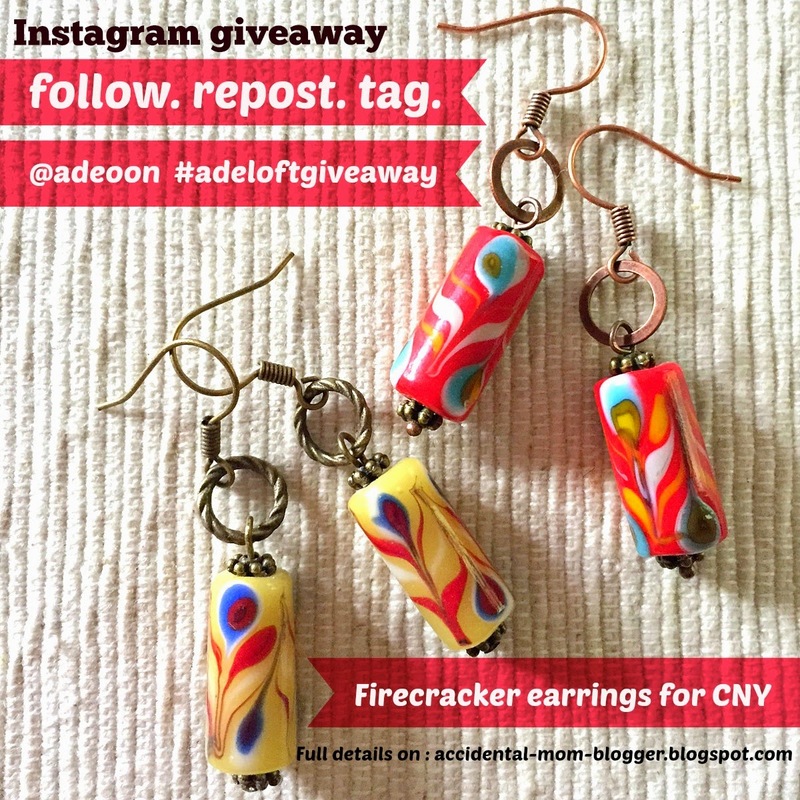 2) Repost the photo, tag me @adeoon and #adeloftgiveaway so that I can put you in the draw. 3) A random draw will be conducted for two instagramers to win a pair of the above earrings, each! * This giveaway is open only to residents in Singapore. * Winners of previous giveaways done on my blog within the last 6 months will not qualify. * No further alteration on the design will be entertained. * The winner will announced and tagged on Instagram on 23 Jan 2015, after the draw has been made. If there is no response within 24 hours, I reserve the right to draw another winner. * This giveaway ends on 22 Jan 2015. * My decision on which colored earrings to giveaway to the winner is final. * The earrings will be sent out by standard mail. Here's wishing all readers who are celebrating the Lunar New Year - good health, good fortune and success!